Google says that the eCommerce market in India is at an inflection point and will see rapid growth to become a $15 billion market by 2016. According to its annual online shopping growth trends report, compiled by combining an extensive research conducted by Forrester Consulting and Google search trends, India will have 100 million online shoppers by 2016, out of which 50 million new buyers to come from tier 1 and 2 cities. These numbers are driving international giants to start operations in India and challenging existing and local players to rethink their business offering. With a digital boom all set to explode in the country, IndiaMART, India’s largest online marketplace, has rolled out its new brand campaign featuring Bollywood actor Irrfan Khan, to drive the core message of “Kaam Yahin Banta Hai”. The 200 crore company headquartered in Noida has launched a 360 degree campaign to create extensive awareness among masses on the wide offers available to buyers across the globe, who can easily find sellers across different product categories, by simply logging on to the portal. Conceptualized by McCann, the 360 degree campaign has a sizable digital integration. Lighthouse Insights provides an extensive coverage of the digital and social media initiatives at its exclusive page. Going further Print and TV are also going to be integrated. With a sizable presence on Facebook and Twitter, IndiaMART leveraged social media to create the much needed pre-buzz for the campaign. Starting off from 17th November a Monday, the IndiaMART Facebook and Twitter pages began a series of teasers around the new brand communication. Post lunch it launched its social media campaign called #AaramKiTune. To start with the brand that has more than 2K followers on Twitter asked people to share that one song they hummed when they wished to lighten up. Playing along with the idea of relaxation, IndiaMART kick started its grand musical-themed contest with great fervor on social media using #AaramkiTune. Besides the brand also gratified lucky winners every hour. To get the word around, the contest was also promoted on the brand’s Facebook page and other mediums like Radio where listeners are being made aware of the Twitter contest. On getting a good response from fans on social media, IndiaMART continued the Twitter contest on day two too. Meanwhile IndiaMART came up with a cool video – a mashup of people singing their favourite relaxing tunes. The fifty-second video showcases popular songs from Bollywood being sung by people across all generations and walks of life. This injected the much required energy to the social media buzz. By day three, November 19th the brand revealed the celebrity face associated with the campaign after creating a little buzz using a pixellated image and a contest around it on Twitter. To make life easy for fans, the brand gave some hints from his professional life. With this activity IndiaMART tried to keep up the momentum that it had created with #AaramKiTune on social media. The day ended with a promise from the actor that he will reveal his #AaramKiTune on the 20th. On 20th, IndiaMART followed the digital marketing trend of launching the TVC exclusively for its social media fans. The less than a minute long video shows Irrfan playing his “aaram ki tune” on IndiaMART while making the required purchases. 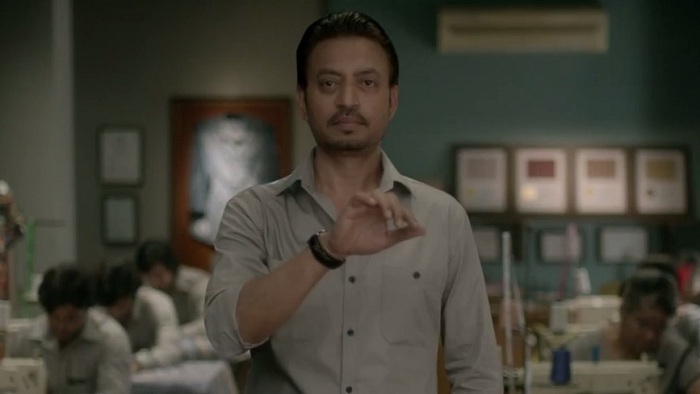 An employee of a manufacturing house, you see a confident Irrfan finding relevant suppliers on Indiamart by just playing the ‘aaram ki tune’, while placing orders for fabric, office furniture, buttons used in manufacturing of shirts, air conditioners, and more. Thereby demonstrating that finding relevant suppliers/sellers is as quick and easy on IndiaMART as playing your favourite tune! The TVC ends with the brand message “Indiamart.com – Kaam yahin banta hai” (work only happens on Indiamart). Uploaded on YouTube, the video has gained more than 2K views and has also been shared on Facebook and Twitter. The views are going to scale up with the brand now investing on YouTube ads too. Besides a microsite has been built with the TVC embedded. It could have been better had the entire campaign for IndiaMART been driven from this microsite rather than from the various social networks. IndiaMART scores with its new brand positioning and digital integration. With the digital boom in the country, IndiaMART known as the world’s second largest B2B marketplace, is successfully shedding off its old image with the #AaramKiTune campaign. In its new TVC, it has highlighted that buying/selling of products on IndiaMART is easy and effective, just like playing your favourite relaxing tune! “The TVC is targeted at the smart buyers who are looking for a much reliable, quick & effective solution for all their key buying requirements. It establishes the fact that IndiaMART is their first choice,” added Aneesh Jaisinghani – ECD, McCann Group. Also, IndiaMART is trying to connect with the young audience of the country through its latest social media campaign. A simple and effective social media campaign like #AaramKiTune is commendable from IndiaMART, specially when the majority of its target group is still offline. The Twitter contest, constant buzz on social networks and exclusive TVC launch on social media will only strengthen IndiaMART’s belief in social and digital moving on from here.